Today, the Intergovernmental Panel on Climate Change—a body of eminent and respected scientists established by the world’s governments in 1988—released its Fifth Assessment Report on the state of climate change. The report is a chilling (no pun intended) reminder about dangers of living in the anthropocene era – where human action is impacting all life on the planet. The IPCC report draws attention to two facts that call Catholics and all people of good will to action. First, the report strongly affirms the option of the vast majority of scientists (including those on the Pontifical Academy of Sciences) that climate change and global warming are a direct result of human action and inactions. Second, the report offers a vision to the future. Even if we were to stop carbon emissions today, sea levels will very likely continue to rise and our global ecology will change in dramatic ways. All of us therefore have a responsibility to act. This is not simply a matter of higher temperatures and displaced polar bears; it’s a question of justice—climate justice. Both Pope Benedict XVI and Pope Francis have called Catholics to act to respond to climate change and the change our lifestyles to protect the environment. Both popes have noted tragic reality about how the poor are disproportionally impacted by climate change. 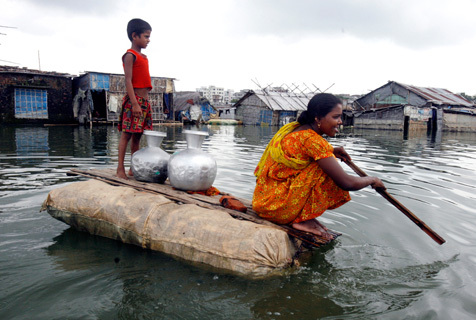 Already it is the poor who have suffered the most from the rising water levels in Bangladesh and as ecological refugees and it will be the poor who will suffer the most from our carbon-driven lifestyles. Despite the science and the pleas by popes and bishops, there are doubters. Catholic Online, for example, published a story questioning the legitimacy of the IPCC’s work and making no mention of the church’s clear position on the issue of climate change. Similar denials can be found on other “Catholic” websites with clear American political agendas. Thankfully, the US Catholic Bishops and all the major national Catholic organizations have sought to take action on the issue of climate change. The Catholic Climate Covenant and St. Francis Pledge are important steps forward to mobilize action. I. Reduce worldwide carbon dioxide emissions without delay, using all means possible to meet ambitious international global warming targets and ensure the long-term stability of the climate system. All nations must focus on a rapid transition to renewable energy sources and other strategies to reduce CO2 emissions. Nations should also avoid removal of carbon sinks by stopping deforestation, and should strengthen carbon sinks by reforestation of degraded lands. They also need to develop and deploy technologies that draw down excess carbon dioxide in the atmosphere. These actions must be accomplished within a few decades. II. Reduce the concentrations of warming air pollutants (dark soot, methane, lower atmosphere ozone, and hydrofluorocarbons) by as much as 50%, to slow down climate change during this century while preventing millions of premature deaths from respiratory disease and millions of tons of crop damages every year. III. Prepare to adapt to the climatic changes, both chronic and abrupt, that society will be unable to mitigate. In particular, we call for a global capacity- building initiative to assess the natural and social impacts of climate change in mountain systems and related watersheds. We appeal to all nations to develop and implement, without delay, effective and fair policies to reduce the causes and impacts of climate change on communities and ecosystems, including mountain glaciers and their watersheds, aware that we all live in the same home. By acting now, in the spirit of common but differentiated responsibility, we accept our duty to one another and to the stewardship of a planet blessed with the gift of life.